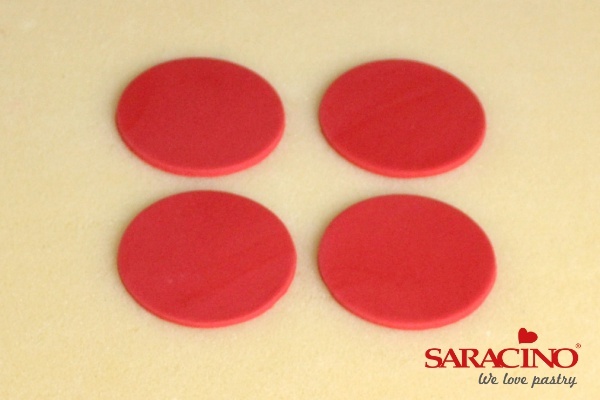 Roll out red sugarpaste (pretreated with tylose powder) and cut 4 x 58mm circles. Set aside to dry completely on foam mat. Roll out fuchsia pink paste to approx. 6mm in thickness and place a piece of cling film on top. Smooth over with fingers so there are no creases and push heart cutter down on top. Carefully remove cling film (making sure the cutter hasn’t left any on the top of the paste) and set aside to dry. Repeat with the rose paste. Use a stitching tool to add detail around the edge of the rose heart and leave to dry. To make the cloud roll out a number of white paste balls in the palm of your hand. Try to have a variety of different sizes. Stick the balls onto the topper with the larger balls in the centre and getting smaller towards the two sides. 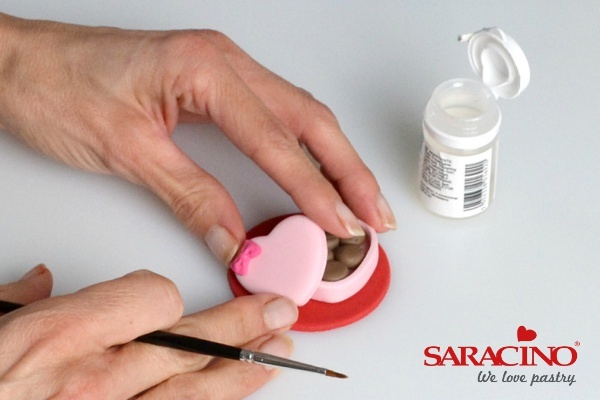 Using sugar glue, stick the rose pink heart onto the right hand side of the cloud at an angle. If necessary turn the topper around and support the back with another small ball of white paste. Glue the second fuchsia pink heart onto the left hand side of the cloud, also add a spot of glue to join the two hearts together in the middle. Push together gently onto the cloud. 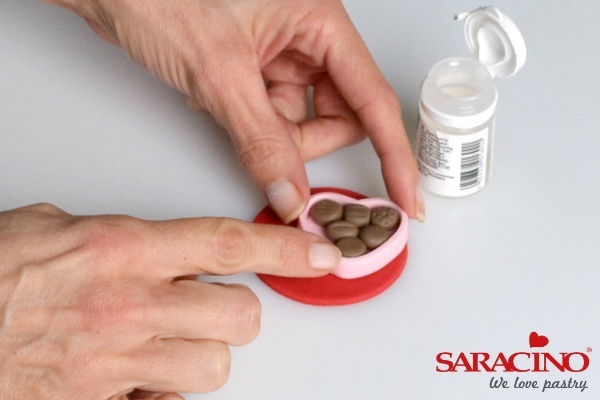 Again, if necessary, add a white paste ball to the back to support the heart. You may now want to add in a small white paste ball or two just to finish off the cloud. Leave to dry completely. Roll out a piece of fuchsia paste about 6mm in thickness. Cover with cling film and smooth the top. Cut out a heart shape as before. Use a small dotting tool to make two dents for eyes and set aside to dry. Roll out a piece of white paste approx. 3mm in thickness. Use a knife and ruler to cut a strip approx. 16mm long and 6mm wide. Cut this into two lengths, one 10mm and the other 6mm. Using a piece of paste of the same thickness cut out 2 small diamonds using your diamond plunger cutter (1cm) Cut another diamond with a 13mm diamond plunger cutter. Cut the larger diamond into two triangles. Using sugar glue attach the small rectangle to the heart approximately half way down on the right hand side. Attach the other larger rectangle to the left hand side of the heart opposite the previous piece. Roll two small balls of black paste and glue into dents for eyes. Add small pieces of white paste for accents. Using a small amount of sugar glue attach the large heart (with arrow) to the middle of one of the toppers and support from behind whilst drying. Roll out the white paste to approximately 3mm in thickness. Cut out a rectangle approximately 35mm by 28mm with a knife. Remove a triangle from one of the long sides of the rectangle with a knife. 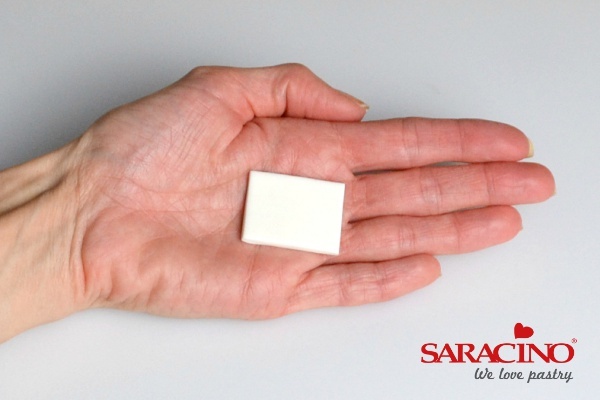 Roll out another piece of white paste thinner to approximately 2mm in thickness. Lay the cut shape on top and using a knife cut around the three straight sides. You will have two shapes like this. Roll out the fuchsia paste and rose paste fairly thinly. Using the large and medium heart plunger cutters, cut out one large fuchsia heart and two medium rose pink hearts. Attach the larger fuchsia heart to the envelope just slightly above the middle checking that when the other piece is overlaid it is poking out. 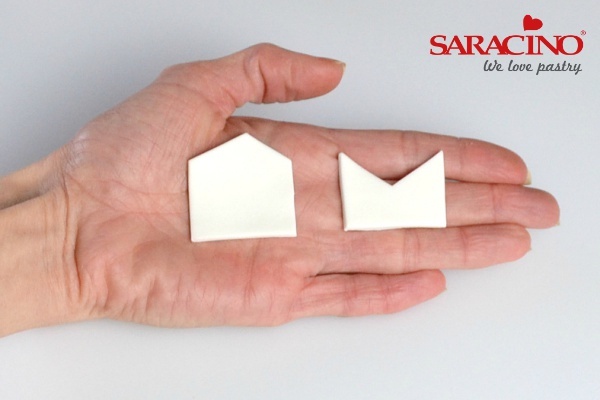 Use sugar glue to attach the other piece of the envelope on top. Add the two medium sized rose pink hearts to the top of the envelope with sugar glue. 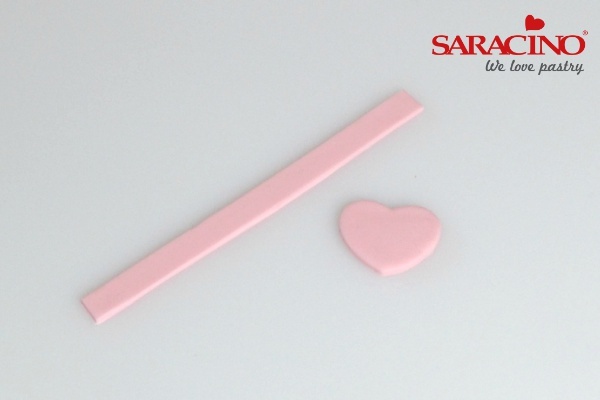 Roll out the rose pink paste to approximately 2mm in thickness and cut out a large heart. Roll a strip of rose pink paste and set aside for a minute to slightly harden (as this makes the next step easier) using a long bladed knife in a rocking motion cut a strip approximately 1cm in width. Brush a small amount of sugar glue around the side of the heart. 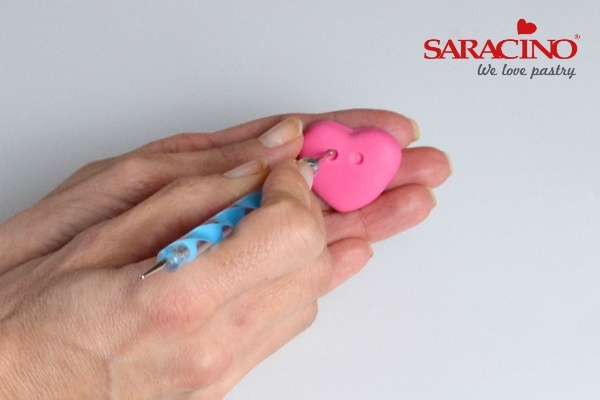 Use the blade tool to push the paste into the shape of the heart. With a craft knife cut off the excess paste and use a small amount of sugar glue to stick the two ends together. 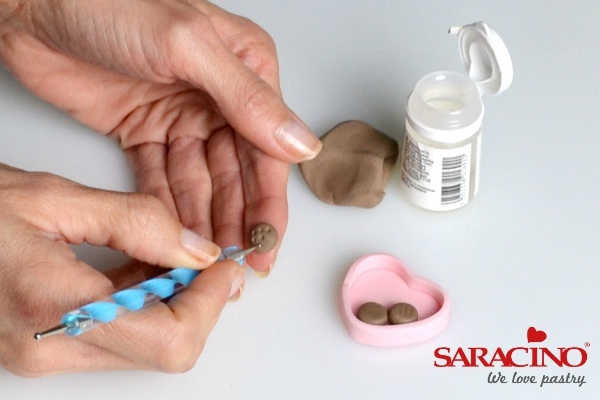 Using small balls of brown paste make chocolates for the inside of the box. Mark the tops of the chocolates with a small dotting tool, shell tool etc. Secure inside the box with sugar glue. Don’t worry if there is a gap on the left hand side as the box lid will cover this. To make the lid roll a piece of rose pink paste approximately 4mm in thickness. Cover with cling film as before and cut out a heart. Take a small piece of fuchsia paste and use a small mould to make a bow. Glue this to the top left of the heart with sugar glue. Stick the chocolate box to the right hand side of the topper with sugar glue. Add the lid at an angle securing with sugar glue. Set this to dry. 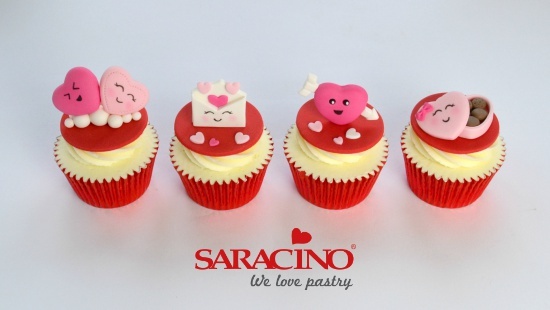 When completely dry use an edible black pen to mark on the faces and eyes of the hearts, envelope and chocolate box. Be very careful here as they are still quite fragile. Use some soft pink edible dust to add pink cheeks to the pale pink heart on the cloud, the pale pink chocolate box lid, and the envelope.